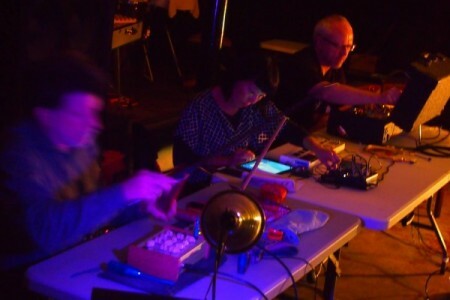 The SF Bay Area’s Tender Buttons (Tania Chen, piano/electronics/toys; Gino Robair, modular electronics; Tom Djll, modular/circuit-bent electronics) rewinds classic electronic musics in a swarm of devices and languages, composed in the moment via a shared esthetic of severe improvisational methods. Friendly spirits Fluxus, WDR, Cage, On-U and Kling Klang are never far away. Tania Chen is a pianist, experimental musician, free improviser and sound artist, working with pianos, keyboards, found objects, toys and lo-fi electronics. She has performed the music of John Cage, Earle Brown, Schoenberg, Webern, and Chris Newman. She is equally known for free improvisation, collaborating with musicians including Roger Turner, Lol Coxhill, Alan Tomlinson, Terry Day, Wadada Leo Smith, Jon Raskin, Bruce Ackley, and Henry Kaiser, while last year Tania toured John Cage’s Indeterminacy with Steve Beresford and Stewart Lee. Gino Robair has created music for dance, theater, radio, television, silent film, and gamelan orchestra, and his works have been performed throughout North America, Europe, and Japan. He has recorded with Tom Waits, Anthony Braxton, John Butcher, Terry Riley, and Lou Harrison, and he is one of the “25 innovative percussionists” included in the book Percussion Profiles. Tom Djll is a composer, improviser, and occasional writer on music, educated at the Colorado College, the Creative Music Studio and the Mills College Center for Contemporary Music. He has worked with Pauline Oliveros, “Blue” Gene Tyranny, James Tenney, Rova Saxophone Quartet, Fred Frith, Vladimir Tarasov, and Frank Gratkowski. Djll’s Grosse Abfahrt project is documented on recordings from the EMANEM and Creative Sources labels. An acoustic-electric duo with endless possibilities, Syrinx Effect plays their own blend of folk punk jazz. They easily switch between dreamy ambient loops, catchy pop riffs and found sounds, all the while paying homage to their free improv roots. Naomi Siegel plays trombone with guitar pedals and Kate Olson plays soprano saxophone with laptop and other toys. The duo got its start curating the Racer Sessions in Seattle, and has gone on to perform prolifically around the US, collaborating with many of the mainstays of the improvised music scene such as Wayne Horvitz, Robin Holcomb, Elliott Sharp, Bobby Previte, Stuart Dempster, Allison Miller, Rene Hart. Syrinx Effect makes music that is authentic and expressive, employing everything from simple folk melodies to abstract, ambient noise. Each piece is a meditation, an exploration, and sometimes a romp.